* if only I could find the link! On NPR's Morning Edition this morning, they interviewed college kids who were mad that Facebook is now open to everyone, and all I could think was "Sweetie, shhhhhhhhh. The grownups don't care. The grownups are trying to work." I Lied About Sweet November. 1. I am very busy today. 2. I think the movie titles, without their contexts, make each list sort of a neat little revealing found poem about each borough. 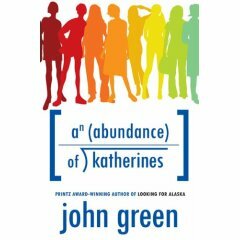 And I love that kind of sh*t.
Today's guest-post on the Jane Magazine blog: my friend John Green's comic novel, An Abundance of Katherines, comes out today, so I celebrate it and offer my theory of John's writing success. You can buy the book here. And it's really really good! Yay! Today's guest-post on the Jane Magazine blog: 4 Books Worth Reading. Today's guest post on the Jane blog: I find a reference to The Grapes of Wrath in last night's premiere of How I Met Your Mother. It just doesn't get any dorkier than that, folks. * Gawker finally launches their music blog, Idolator. I think it looks nice (and Maura rules). I hope people keep the hate to a minimum because in the words of the great Patton Oswalt: "There's room for everyone. You can make it your own way." Also, come to What's My Line? live tomorrow night at the Parkside Lounge at 8. It was tons of fun last month and I can't wait to be a panelist again. All the info is here. Be Michael Showalter's Intern OMG! "ARE YOU AN ENTERPRISING YOUNG MAN/WOMAN LIVING IN NYC? For instance a college student or recent college graduate? Are you interested in being my intern/assistant/lackey for frighteningly little pay several hours a week? If so, please contact me and let me know! I’m looking for just such a person. If you are this person or think you know who this person is you can contact me at Michael(AT)msofficialsite.com"
This weekend's Times article about people finding out they were dumped from their ex's myspace/friendster/facebook profile or whatever is almost too self-parodying to even begin to make fun of, but I'm going to try. For one, who did not, in the spring of 2003 when Friendster first came out, at some point think to themselves "Someone should do a story about how people in relationships use their Friendster profile to signify to their ex that they've moved on. Maybe I should do it because I really need money right now. Naw, it's too laaame. Give it three whole years and it'll be in Sunday Styles. Hahaha! Get it, me? Because the Times is so behind? Especially, particularly, the Styles section? I'm so funny." Also, look at all the other parts of the profile. Where's the story on people who found out from a social networking site their friend was a fat Libra with only some college who makes less than 15k per year? Where are they?THEIR STORIES MUST BE TOLD. “Seeing that was like a kick in the stomach,” said Micaela Coady, 30, a health researcher from Brooklyn who was so affected by an ex’s status shift that she abandoned her Friendster account (she now blogs instead)." If Mark is in any way responsible for Jared Leto talking about "making love" during the only five seconds of the VMAs I watched last night, we are no longer friends. Hysterical: a look at the evolution of Chuck Klosterman's author photos, by Doree Shafrir. Via Emily: FourFour puts Living Dolls, the shocking and heartbreaking expose of Southern child beauty pageants, up in its entirety. After six years, my first bio page. Have a nice weekend! When I come back on Tuesday I'll be guest blogging on Janemag.com again for the month of September (update: moved to Monday 9/11), but there will still be stuff here. Also, if anyone out there thinks they know a way to help me set up *true* domain mapping between my hosting company and typepad (right now lindsayism.com just points here, messing up all the archive posts. The two sites are not truly mapped. ), please let me know.